My husband says my son has too much stuff. But I think the problem, per se, isn’t the quantity, it’s the under-footedness of it all. 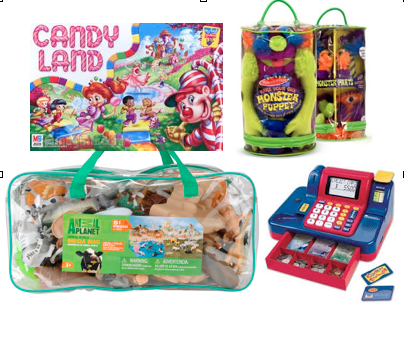 Luckily, the toys we have today don’t bleep and bloop and sing those inane alphabet songs anymore. But they’re misshapen, sticky-outy, big, and kind of all over the place. The medium-sized things (paints and paintbrushes, marble maze kits, plastic food, toy cameras, etc) get stuffed in the fridge, oven, and cabinet space of Fionn’s 2011 Christmas present. Like the proverbial hall closet, things tend to fall out on unsuspecting playdate guests, but such is the price of a clean front room (where this lives). But then, this. 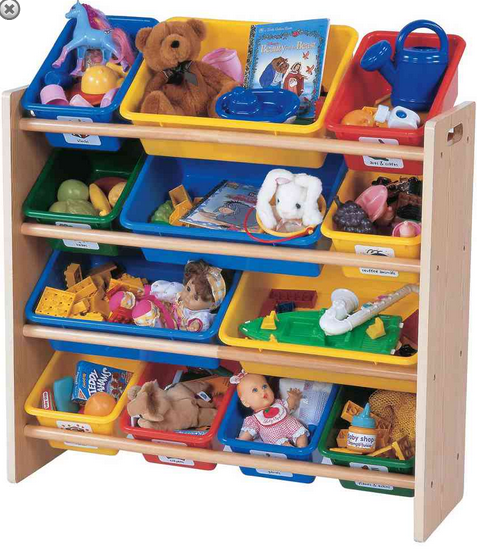 These are the toys that trigger my OCD-panic and challenge my organizational desires. When we changed the room over, we got rid of those cute, but somewhat useless, book display ledges we so proudly drilled into bricks to install. the today me is cackling at the 9-months pregnant me at these. 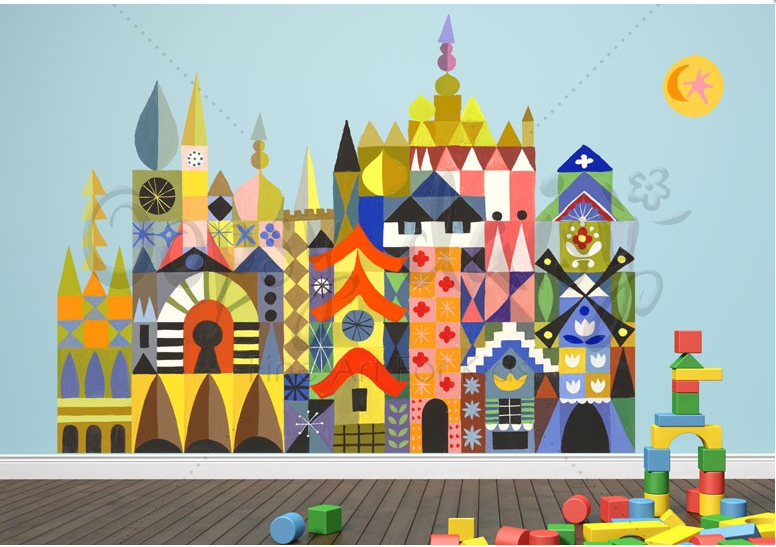 So I went trawling the internet to find some potential new solves (that might also prevent a spackle-and-repaint for those awesome wall holes). And it’s not about the bins, bags, or boxes – the goal is to get this stuff off the ground. 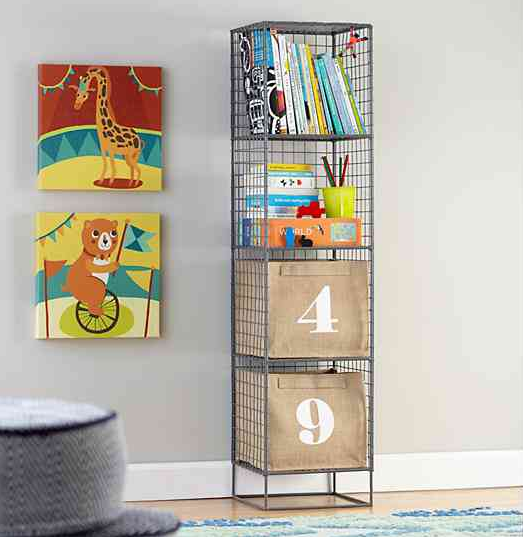 Totally digging this Land of Nod “On The Grid’ bookcase-like thing, but for $200 bucks, it seems a little crazy. But the whole three potato four-ness of it is pretty awesome. This is quite inspiring – wall-mounted curtain rods and hooks, everything hanging off the wall. One of those “you don’t need to spend money, all you need is a spice rack and a glue gun” solutions, but this one seems to be simple enough to be cool (see link to b-inspiredmama.com) It could work on the figurines and soft stuff, but then there’s still the board games and cash register to figure out. So, like everyone else on a desperate Saturday afternoon of non-finds, I end up at Ikea. But this could be really nice. 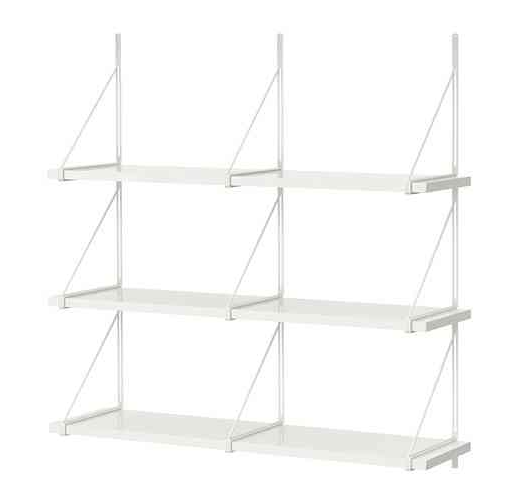 It sort of reminds me of the Elfa systems at the Container Store. And if it were to work, it doesn’t look like it’d occupy too much space or feel too bulky. Go Ekby Jarpen and Ekby Gallo. For $75 I might even do it then change my mind shortly afterwards. Any advice is very welcome while the drill is charging and the Zipcar is being reserved. Over the past few months, our lives have changed again. Me getting comfy in my big city job, hubby moving offices so we sometimes even see each other in passing or on the way to the subway, and buddy boy strollering-then-scootering-then-walking his way off to preschool. Now it’s the summer and it’s time for another momentous shift in our lifestyle. It’s big boy room. For reals this time. And we’re living the twin-sized life. I’d never heard of Cymax before, but I found this South Shore Treehouse loft bed there for the best price – $540. 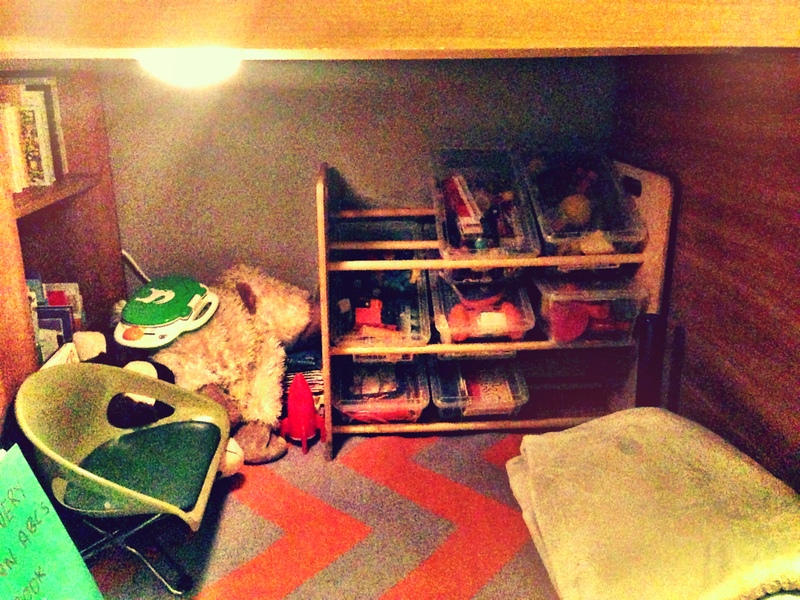 Cool thing is that it’s got the trifecta of young kids’ options – higher sides to prevent roll-outs, drawers and hiding storage spaces for all the toys that somehow mysteriously end up in our house, and the best part… a space underneath for hiding, reading, and playing. We put in one of those battery-operated slap lights, Fionn’s little Cosco booster, some storage stuff. But it just lacked something. So Mommy gave in to the decal monsters. But here’s why I’m OK with it. It’s going UNDER the bed. And to Fionn, under the bed could very well be under the sea. (Whatever works, I say). But I think there are three basic ways of doing decals that don’t offend my (not very delicate, after nearly 4 years of parenthood) design sensibilities. One: Keeping them in a confined, limited space. Framing a crib, OK. Filling a gap under the bed, fine. Adding some great outdoors to a non-great-outdoors-facing space, ingenious. 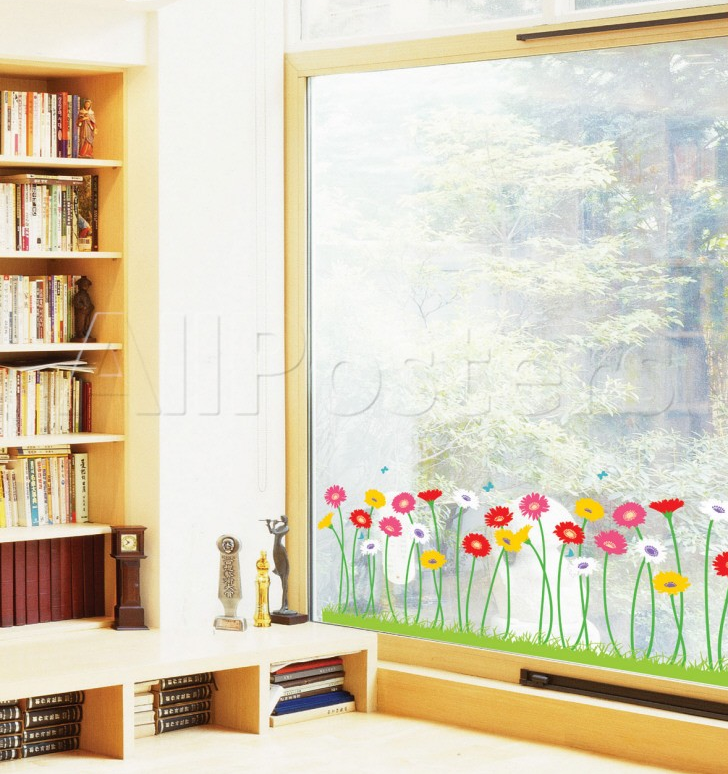 These Growing Flowers are adorable, and purposeful, in a modern, interesting way. 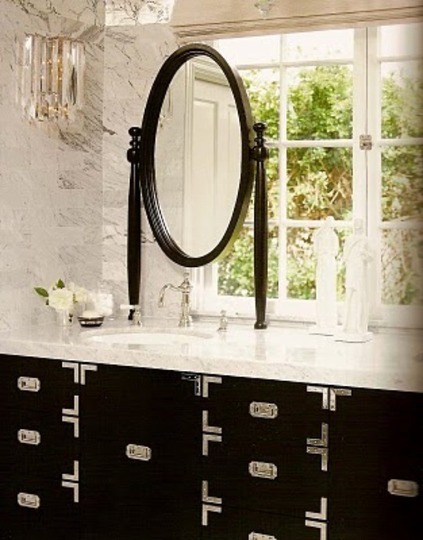 Two: Complementing and reflecting a design theme already chosen for the room. 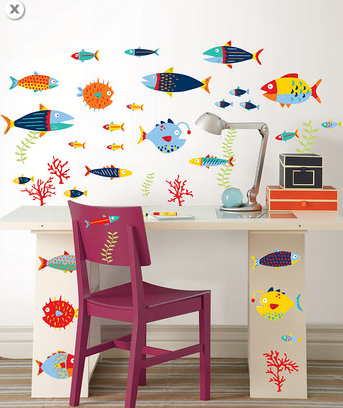 Skip*Hop has some really bold, kid-friendly decals that match the bedding designs but, even when put together, don’t go over the top into cutesy territory. (Criteria one probably applies here too. 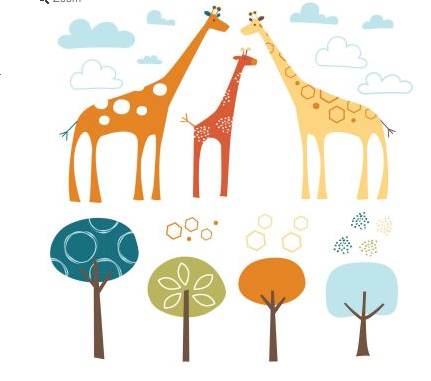 Think about placement to avoid ‘floating giraffe’ syndrome). 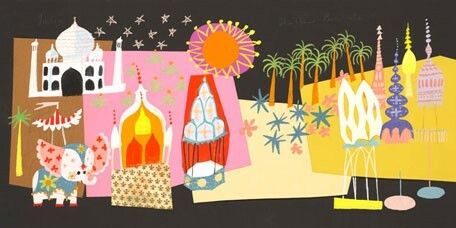 And, three: Finding a GORGEOUS piece that takes the place of a framed artwork. Whatever. All I know is that they’re amazing. Sadly, you’re going to pay for the amazingness – a small one (18×24, I believe) is about $100 and the 20×30 is about twice the cost – versus the $20 average you’ll probably spend. If you’ve got a room where these work, I’d soooo go for it. They’d probably be the perfect size to fit under a loft bed. Now that the baby is a boy and the toddler bed is soon to be outgrown, I’ve been thinking about “The Next Big Project” to distract myself with. 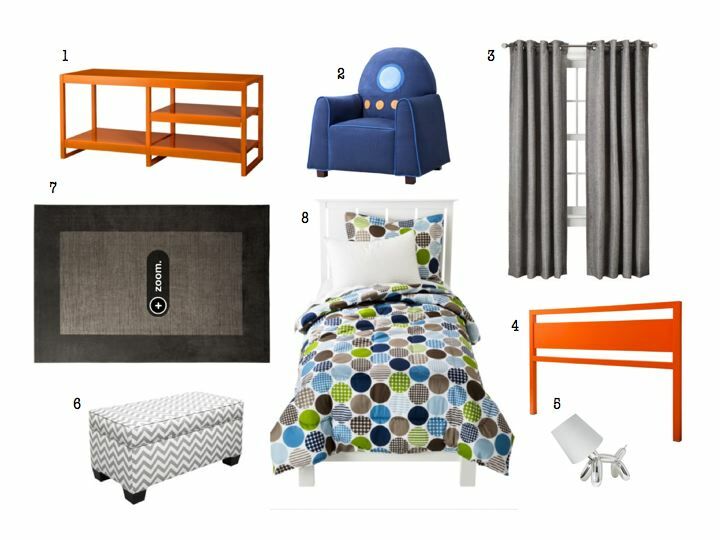 While checking out the Target website, I noticed that they’ve recently launched a few new design/furniture collections. Some seem cribbed from CB2, others look more Pottery Barn Kids with a bit of Dwell Studio thrown in. Some might say the cupboard looks a bit ransacked. But no mind to the source of inspiration, someone in Minneapolis seems to be doing right by the “design for all” philosophy. 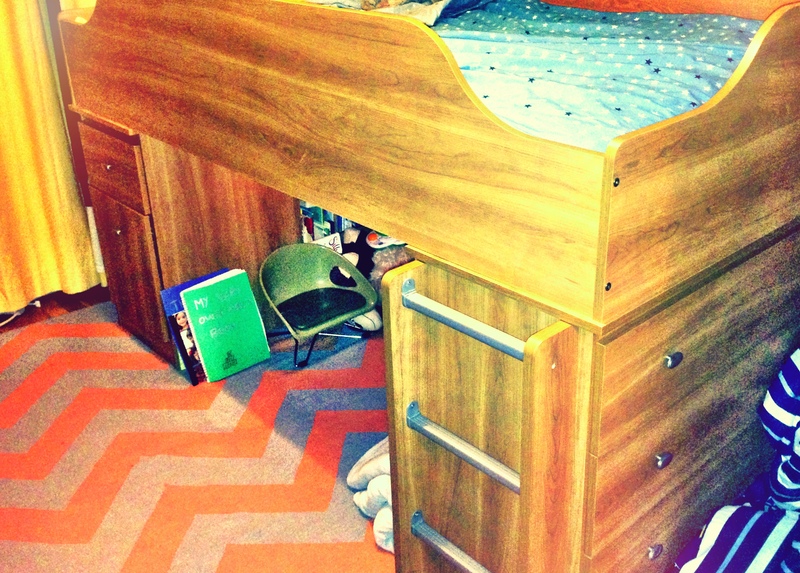 I started with the awesome Calhoun metal headboard and TV/storage unit. I then complemented with warm gray (nearing brown) accents, introducing a few patterns for interest. I’m kicking myself for not buying this lamp (above) when it was available. Now it says “not available” online or in stores. But it’s genius, isn’t it? A Jeff Koons balloon dog combined with the Teddy Bear lamp from SuckUK, but decidedly less creepy. Hope they bring it back. So here’s the assortment. Click the image to enlarge. 1. Calhoun Media Stand $169.99. 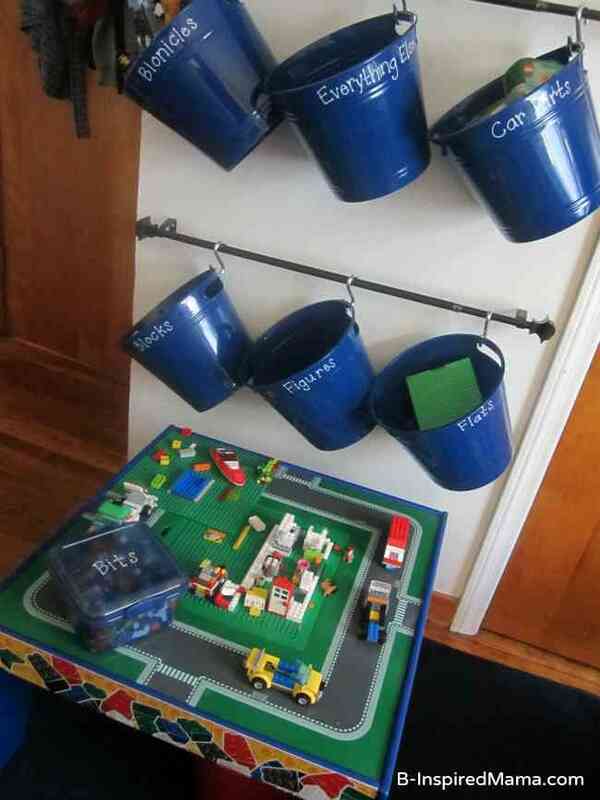 Meant for a TV, but can be used with storage bins for clothes/toys/junk. 2. 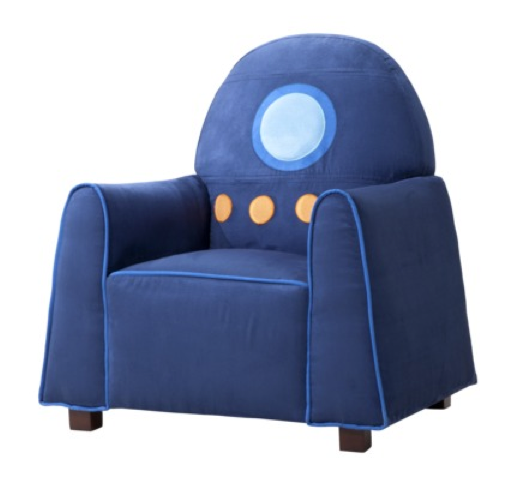 Chloe & Conner Rocketship Chair $99.99. 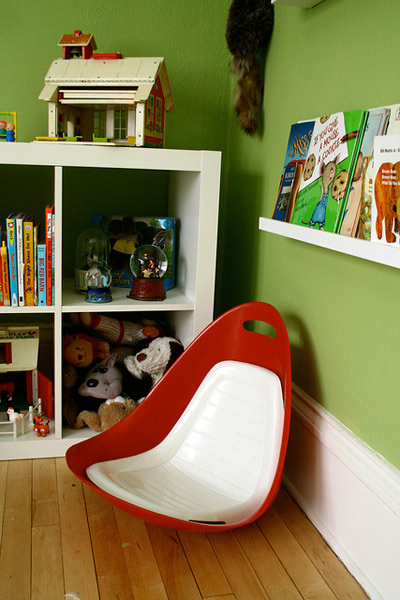 The most ‘kiddie’ item in this room, but so cute. 3. Target Home Basketweave Window Panel $24.99. I much prefer grommet-top curtains to any other kind. These may need backing with room-darkening curtains, but would still be a bargain. 4. Calhoun Headboard (twin) $109.99. It comes in black too, for the more risk-averse. 5. 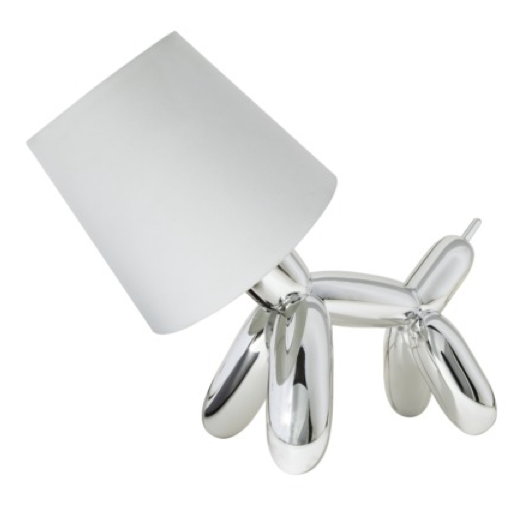 Dog balloon lamp (unavailable?!) $34.99. 6. Upholstered Storage Bench in Gray $249.99. Expensive but super cool. It comes in multiple fabrics… for a brighter look, there’s the Panama Wave Storage Bench , $279. 7. Threshold Basic Border Rug $179.99. Reasonable enough to loosen the Play-doh restrictions. 8. Room 365 Dot Comforter Set (Twin) $69.99. Love. Want this for our own bed. If you’ve discovered anything surprising or cool at Target, drop me a line- I’d like to know. I am so excited to feature this artist on RFYO; Rob Bridges embodies everything I love about design and fits my aesthetic to a T. And, even better, Rob’s an up-and-coming artist whose prints (and awesome back story) are available for anyone to buy on Etsy. The story begins with Lionel Tiberius Jones, “or as he is better known, “Little Lionel Jones,” who cites Django Reinhardt as a major influence. 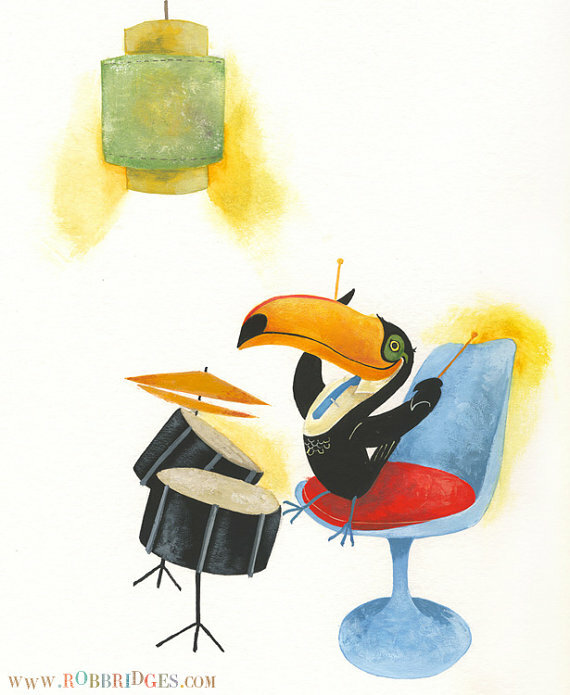 Little Lionel and his band the 18 Karats has four members, a fox bassist named Tricksy Mingo, Buddy Hambones (a piglet) on the trumpet, and a toucan percussionist named Chico LaRoca. Lionel, as Rob writes, “hails from the small fishing hamlet of Rutabaga Island, just a hairs throw off of the coast of greater Maine. The runt of the litter, his mother gave him his moniker as the result of her oft “stymie-ifcation” due to the youths herring sandwiches and sprung guitar chords piled in forgotten lumps on his bedroom floor. 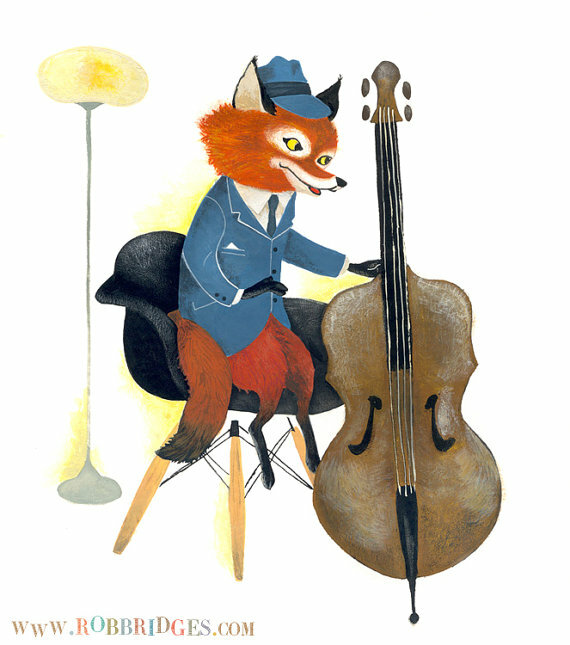 Rob sells his painted illustrations here on Etsy for $40 each or $120 for the set. But this isn’t the only work from Rob. 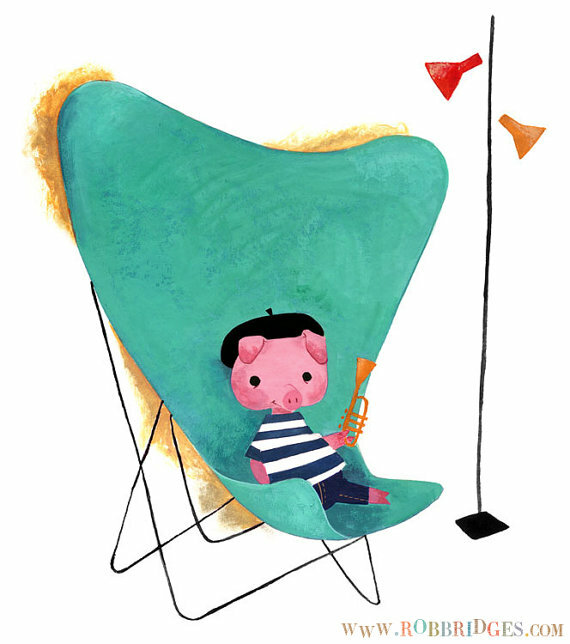 Of course I love the Richard Scarry influence and clever use of Eames and Saarinen references, but Rob’s got a broader range of work that’s equally lovely. 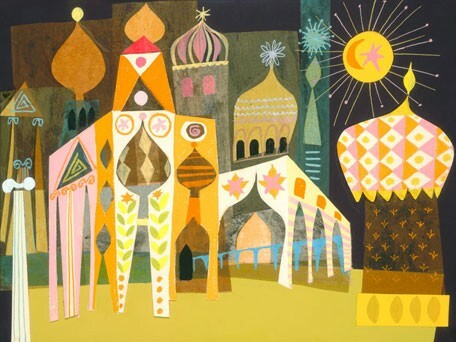 His gouache-on-paper works are incredible, and perfect for children’s books. 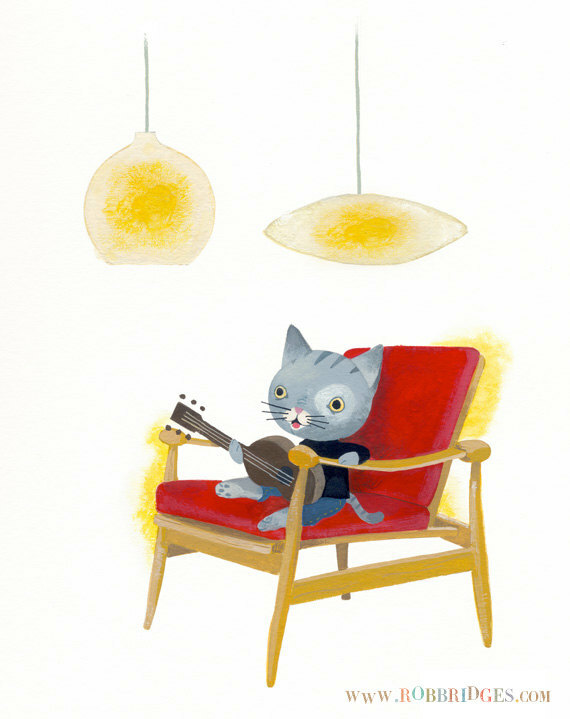 In fact, this is a sample from a book he’s planning, called A Trip to the Moon. And here’s another: Summer and the Red Banjo, a bit more traditional in vein. If you’re curious to learn more, read Rob’s posts here on Neatorama (a great website, btw) or Juxtapoz. 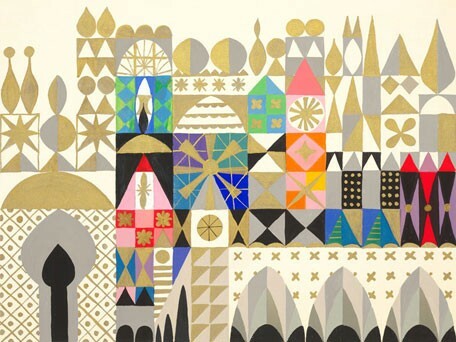 A graduate from Cornish College of the Arts in Seattle, he’s now based in Lexington, KY where he lives with his family. Check out the listing on Etsy, or visit his website – he’ll be glad to hear from you. There are two vintage furniture shops in our neighborhood. They sit side by side. The first one on the corner is called Holler & Squall. (Zak and Gillette are two of the most amazing shopkeepers you could meet. We’re very lucky to have gotten to know them). The second shop next door, Jarontiques, is more in line with the mid-century style to which we’ve all become accustomed (but cooler, and definitely more hipster than the expected DWR-lite stuff you often find at these shops). 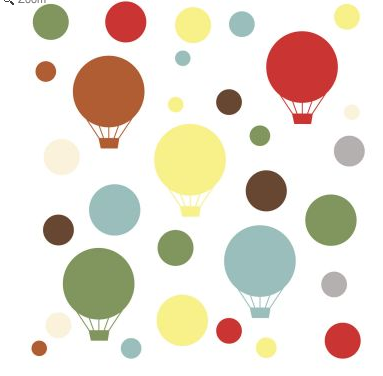 Now, if you would have asked me a few years ago what my design style gravitated to, I would have walked you right up to a Nelson bubble lamp and an Eames fiberglass chair in celery green, and been done with it. 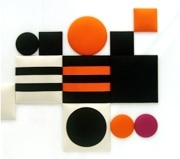 But I have a husband, and his taste leans way more to the browns and oranges than the cool blues and greens I love. Taxidermy? Yes. Worn down leather club chairs? Totally. All of this is a super roundabout way of explaining (to myself, mostly) why I’m so enamored with these “campaign chests/dressers,” which I surely would have dismissed as heavy and overwrought a few years ago. But having happened on the image at top the other day, I’m newly curious. 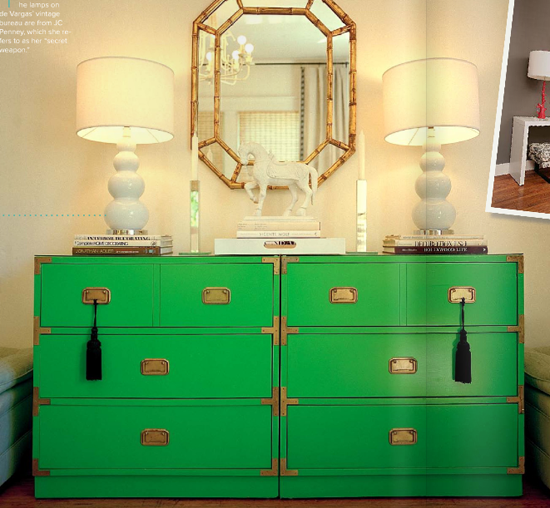 Apparently, this is not a new thing to the internets (i.e., I’m very late; see roundup from Apartment Therapy here). 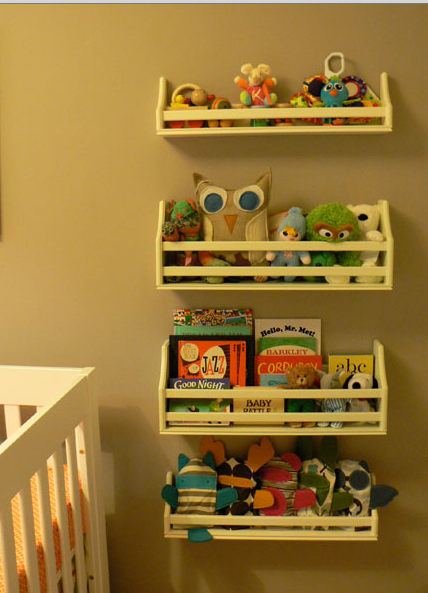 But for those of you with changing tastes, or new winter clothes storage needs, or newly-graduated-from-layette-furniture homes like mine, it could help. Campaign furniture is evocative of luxurious travel and a time gone by… The appeal of its nature has been picked up on and modern furniture made in a campaign style is produced by a number of makers today. 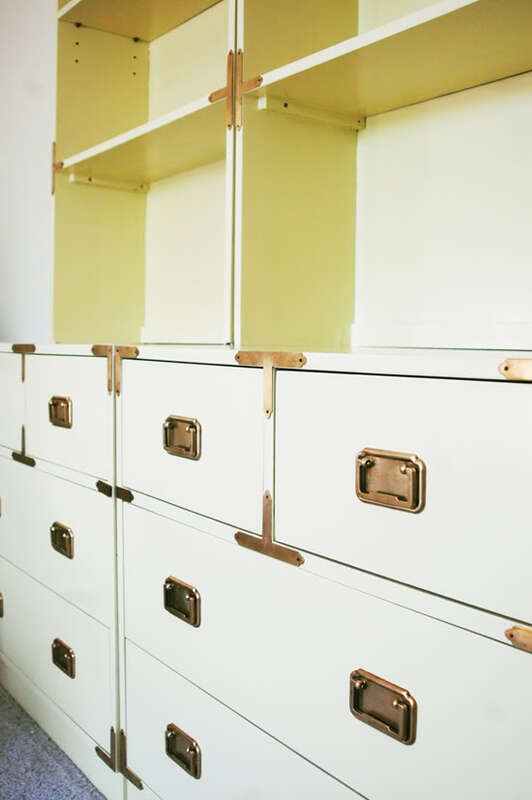 Often, the consideration of portability has not been a factor with the overriding concern being to achieve the look by adding brass corners and strap work. Another group of manufactures have produced direct copies of period campaign furniture seeing that there is still a call for it today be it for safaris or the high class camper. Oops. Ok, so the stuff we love isn’t exactly British Army Issue (good thing, with all the not-so-appealing connections to colonialism and stuff), and is much too heavy to fold up and carry with us, and was certainly not EVER intended to arrive in bright green or hot pink. No mind. 1. Hack it. It’s Ikea furniture, paint and hardware. 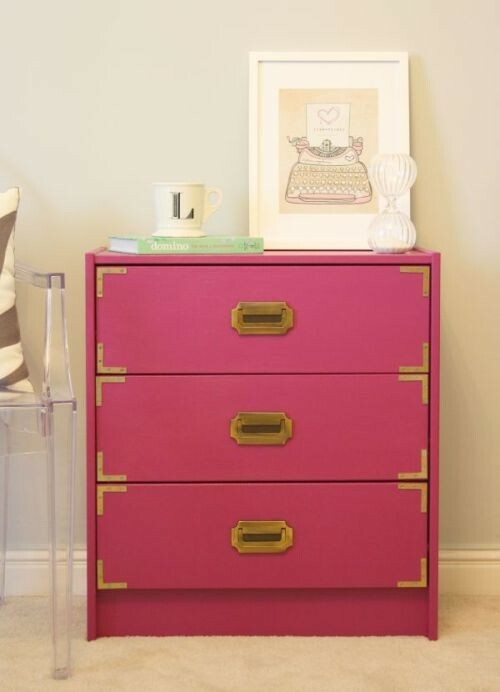 Ikea hacks have done it, so have the For Chic’s Sake blog. It doesn’t look super hard. Apparently, you can get the brass from Ansaldi & Sons. 2. Refinish it. The amazing Jenny Komenda from Little Green Notebook did this herself. Bless her. 3. Buy it. (My preferred method). They’re all over Ebay. 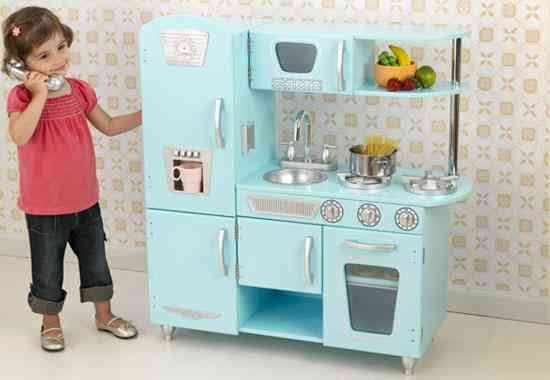 This one (above) is a little different, but I really love the style and the storage possibilities. Currently at $600 and shipped from Miami. 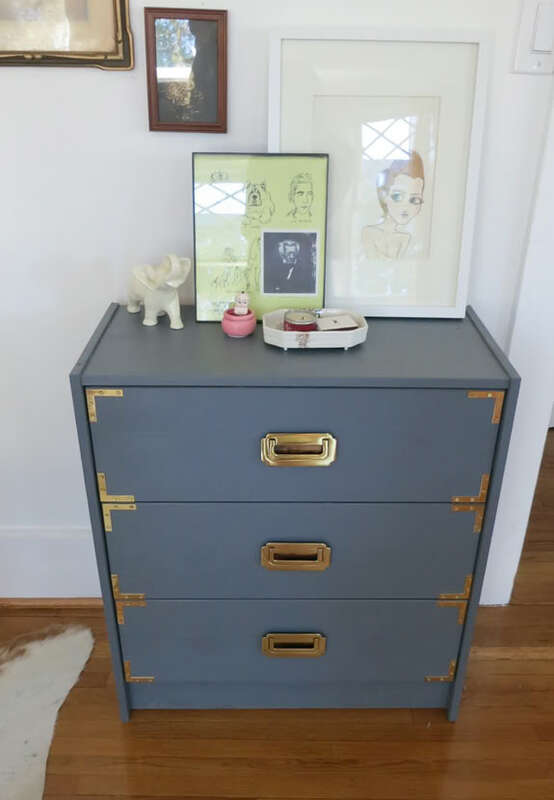 Think of all that BabyMod you’re about to throw away after the drawers are falling in for the third time, and it may not seem like too much of an investment. 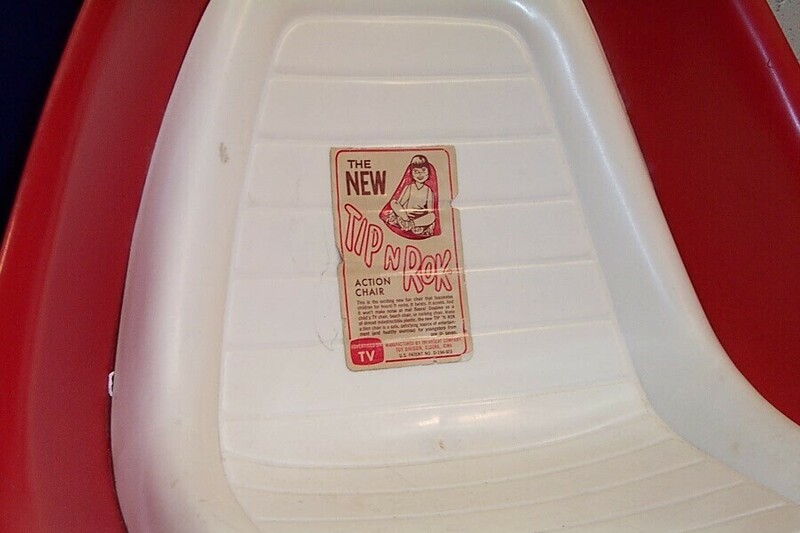 Somewhere between the furniture of yesteryear and the toys of 2012 lies this awesome find, a chair-toy hybrid called the Tip-N-Rok. Although mentioned on multiple websites as a vestige of childhood memories in the 1970s, this wonderful item dates back to the early ’60s (at least). 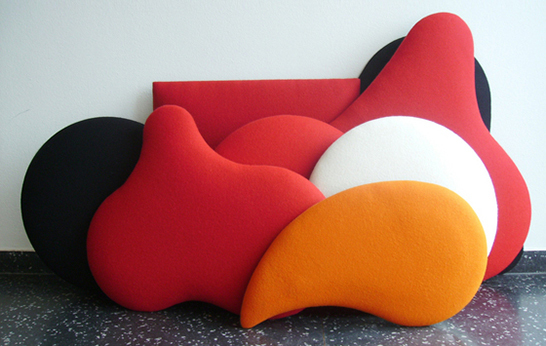 from eames shell to bilibo? 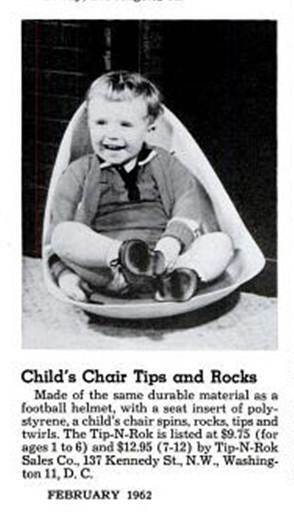 The ad from Popular Mechanics lists the manufacturer as the Tip-N-Rok Sales Co. But over time, it seems to have been made by a number of manufacturers, from the MTA Company (any info would be much appreciated!) 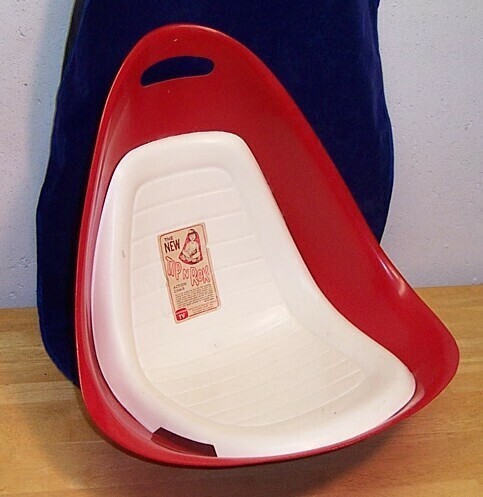 to the Infantseat Company in its latest iteration. To me, it’s a children’s “missing link” between an Eames shell (without legs) to the modern day Kid-O Bilibo (available at Oompa.com). Then I found the chair again in the Apartment Therapy (formerly Ohdeedoh) archives. They found it on the Flickr feed of Alison, mom to Gus, Elsa and Finn, and the woman behind my new favorite blog, Deuce Cities Henhouse. Check it out if you’re into feeling inspired (and very envious…). And for more random chair inspiration, you can find it on this guy’s Pinterest collection too. And then I found two (well-loved, but lovely) Tip-N-Roks on Ebay today. 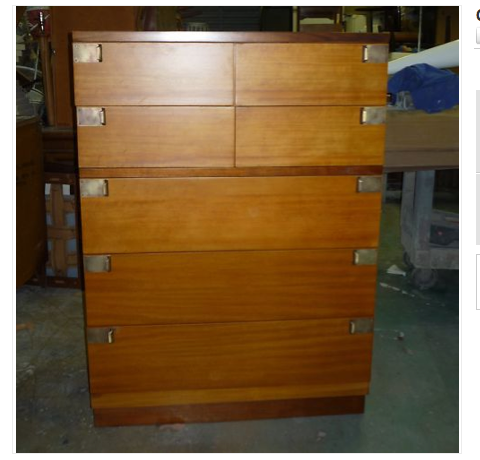 This one (above) is being sold by intothepines. With about a day left, bids are around $30. (The other one is being sold for a lot more, btw). The kid on the sticker seems to be having a good time.